Features :Experience Pure Musical Bliss :- Tango-BT is loaded with High-Class sound drivers which ar..
- Tango-BT is loaded with High-Class sound drivers which are dynamic and provides you with a world-class experience in music and sound . - With Tango-BT you can feel every note of your music . - The crystal-clear sound from Tango-BT will make you experience pure acoustic bliss . - Experience superb music and voice clarity . - Built-in bass boost feature lets you tailor your audio experience for TV, music or gaming on your PlayStation, Xbox or PC, with rich lows and clear treble . - The perfect headphone for audio lovers . - The Protein-leather Memory Padded Tango-BT is crafted for premium quality comfort . - The cushion pads are comfortable and noise cancelling which helps in using the headphones for long hours without any issues or pain . - The cushion pad also helps in reducing sound leakage and provides you with a complete surround sound experience . - WIRELESS MODE : You can enjoy with our Bluetooth microphone for about 10hrs with Bluetooth headphone built-in 250mAh battery . - WIRED MODE : you can also use it as a wired headphone with the provided audio cable, so the headphones will never power off . - Tango-BT offers you true wireless freedom with a Bluetooth v4.0 which provides you with complete freedom of movement . 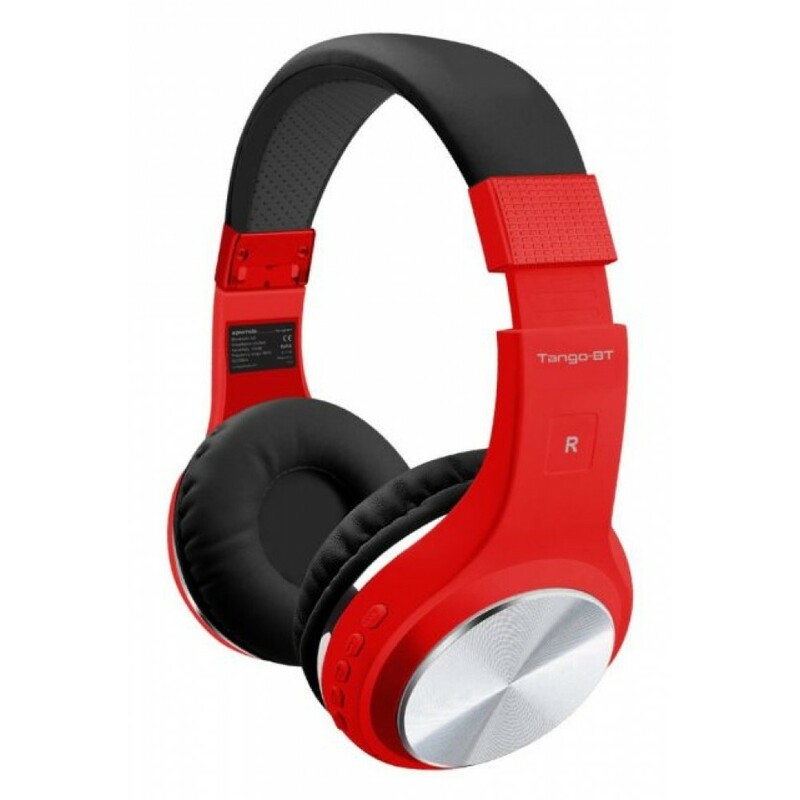 - The headphones can be paired with most of the audio and video devices with Bluetooth connectivity and with all the mobiles and laptops with Bluetooth . - Tango-BT has an operating distance of 10 meters which provides the user with enough mobility and movement space . - Tango-BT also features an in-Line Aux functionality which allows the user to connect the Tango-BT to aux cable and listen to their favourite audio or video with crystal-clear sound and surround experience . - The Promate Tango-BT comes with an Aux cable for all those times you need to connect the Tango-BT via Aux . - The Promate Tango-BT is one of the few headphones out there with an in-built TF Card Reader . - Never miss out on your favourite tracks which can be loaded into any TF Card Reader and plug and play For all those times when you don’t have a phone, or your phone ran out of power . - With the Promate headphones, you need not worry about knotted cables . - This cable is specially designed to resist tangling, so you can store them however you want and pull them straight out, ready for use when you need them . - They won't become distracting and obstructive in your activities either! This is a priceless feature as anybody who has suffered from tangling cables will tell you . - The Tango-BT is the ultimate set of portable sound accessory for all the travellers and wanderers with both wireless and wired functionality making it the ultimate travel companion . - The Tango-BT is a true Portable Headphones which can be folded to the inside making it smaller and portable and can fit inside your bags or even laptop bag without breaking the headphone . - No need to carry special cases or bags for your headphones with the Promate Tango-BT . - Just Fold it Fit it and Forget it . - The Tango-BT is loaded with a powerful 250mAh rechargeable battery which provides you with a music play time of up to 5 hours and standby time of up to 180 hours and talk-time of up to 5 hours . - And if the battery runs out while you are on the move, you can plug-in the In-Line Aux and continuous with your music and video without a break . - The Tango-BT features high-quality protein leather cushion padded cups which along with comfort also provides passive noise cancellation and reduce sound leakage . - The protein leather cups are comfortable on the ears but provide you with a complete soundproof noise cancellation experience . - Take calls from Tango-BT with the touch of a button - crystal clear thanks to the ultra-sensitive built-in dual mic which allows you to use Tango-BT as a hands-free device and attend and speak on your calls without even touching your phone . - The Tango-BT comes loaded with all the navigation controls you need to go through all your music listening journey . - It has a play/pause button volume rocker, and forward/rewind buttons making it a breeze to control your music without even touching your phone . - Connects to any audio playback device that features a Bluetooth V4.0 and 3.5mm socket - including most MP3 players, iPhones, iPads, smartphones, tablets, computers, laptops, televisions and many more devices besides . - Bluetooth Version : v4.0 . - Bluetooth Chipset : BK . - Bluetooth Profile: HSP, HFP, A2DP, AVRCP . - Input voltage: 5.1V . - Bluetooth Frequency: 2.4-2.48GHz . - Charging Time：~2 hours . - Usage Time : 5 hours . - Standby Time : 180Hours . - Battery Capacity : 250mAh . - Battery Type : Li-Polymer . - Compatible with Bluetooth and 3.5mm Audio Jack Enabled Devices . - Compatible with Smartphones . - Compatible with Tablets . - Compatible with iPod, MP3 & MP4 Players . - Compatible with Laptops . - Compatible with Desktop and PC .